The Piedmont"s finest family park since 1935, City Lake Park is located at 602 W. Main Street in Jamestown. The park features 2 playgrounds, a Merry-go-round, miniature train, excursion boat, miniature golf course, swimming pool, waterslide, gym, amphitheater, field stage, 10 picnic shelters, 1 gazebo, scattered tables, grills, 1 non-regulation ball field, concession/restroom/ticket booth building, Historical buildings (Quaker Friends Meeting House with cemetery, Richard Mendenhall Store), maintenance complex, Fish Hut and Camp Ann. There are 10 picnic shelters located throughout the park ranging in capacity from 40 to over 500 people. The shelter fees vary according to shelter size and amount of time rented. There are free standing picnic tables and grills located in the main part of the park available on a first come basis. 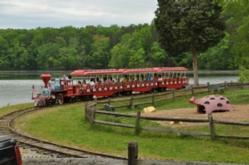 For your family enjoyment, the park offers a miniature train ride, a merry go round ride (adults can ride both), and a 30 passenger excursion boat ride. The park also has an 18 hole miniature gold course for challenging fun time. Tickets are sold at the park concession stand. The park offers 2 handicapped accessible playgrounds. The main playground boasts one of the largest and longest play pieces in the state. A new smaller playground is located in the Camp Ann picnic area. City Lake Park is a 340 acre lake used for drinking water and for recreation. Bank and boat fishing are allowed with proper permits and licenses. The park"s marina rents fishing boats year round and seasonally rents its canoe and pedal boats. Private boats (certain restrictions apply) may launch at the marina ramp. The park is home to one of the largest public swimming pools in the Southeast. There is a large shallow wading pool for small children located next to the main pool. The park also has two exciting waterslides that were completed in 2004. The waterslides are part of the pool complex. The gymnasium is available for rent year round. The gym is suitable for most types of large group events. Advance reservations must be made for its use. The field stage is 20" X 50" and is used for special events and is available by special reservation only. The stage is equipped with power hookups adequate for most events. The Pool and Waterslide is open on weekends only. Weekday operation begins June 13. The pool and waterslide will close for the season on Sunday, August 14. The pool and waterslide can be rented for private parties after regular pool hours. Advanced registration and payment is required. Please call 883-3501 during pool hours for information and reservations. City Lake Park participates in the NC Wildlife Loaner Rod program. The program is designed to introduce kids to fishing by allowing them to sign out fishing poles to use free of charge. Please call the Park for more information. City Lake Park offers 10 modern shelters able to accommodate from 40 to 600 people. The shelters provide a great place for birthday parties, large family reunions, church and company picnics. The gym is available for groups to rent for special events. The Park Marina has bait for sale, fishing tackle and has pedal boats, canoes, and fishing boats for rent. They also offer a package for a boat and trolling motor rentals. Fishing and hunting licenses are now available for sale. Call the City Lake Park office at 883-3498 for more information. Weekdays - 10a.m.-4p.m. ; Saturday - 11a.m.-6p.m. ; Sunday - 1-6:30p.m. Ride operations are open on weekends only, weekday operations begin June 6 through August 12. Weekend operation will then return until October 9. The rides will operate on Memorial Day, May 30. Saturday - 12-6p.m. ; Sunday - 1:30-6p.m. The Park"s tour boat is available for private rentals. Tour boat rental is subject to operator availability. Hours of Operation: Hours of operation are based on daylight hours. The park is open daily for boating, fishing, picnicking and playing on the playground, weather permitting.